I had asked The Universe and the Job Angels for some work. I specifically asked for a job that was well paid, with nice people, interesting work, and some travel. I think someone out there is having fun with me. I have been temping this last month and the job finishes on Friday. The pay is good. The people I am working with are nice. I have to drive to work. That is not what I meant about travel. However, my drive to work is very scenic as I drive along the seafront every morning and evening and there is relatively no traffic as I am going against the main flow of it. As for the work itself, well, it is mind-numbingly dull. I am basically extracting information from one place, putting it into another place, and then putting all of that somewhere else. I am a data collector. To feel good about what I am doing, I have had to look for some positives aspects of the job. Apart from helping the company with the data I am collecting, I am able to listen to my music collection on my MP3 player while I am doing it. This helps relieve some of the boredom and can help me set a pace to my work and keep me focused on the task at hand. I am also listening to stuff I don’t normally listen to as I have my whole collection on shuffle. I could start with a Tango, then have a bit of Rock, some Classical, etc. With the headphones on, I am able to hear things in the music I might not ever have noticed before. Listening to the music also blocks out the voices of the other people in the room I am in, which is part of a call centre. A downside to this work is that the only time I have any human interaction is during breaks, with my colleagues. We tend to take our breaks and lunch together. If we didn’t, we probably wouldn’t really talk to anyone else, or each other, as we tend to speak to each other only if we have specific queries about what we are doing. We have found that talking is a distraction while working. We have certain targets to meet. Speaking about targets, we have surpassed ourselves and surprised our employers as to how quickly we were able to learn how to use their system and increase the target base. We are left to our own devices as they know we just get on with things. A big downside to this work is that it is very tiring. Even with breaks. I am so tired when I get home that I haven’t been dancing. I haven’t been having an evening walk. I haven’t been painting. I’m not really up for cooking. This is so unlike me. It is as if the computer has sucked the life out of me. I know I haven’t worked for a while, but I have never felt like this before. I’m joining a gym around the corner just to get some exercise and the blood circulating through me. If the gym wasn’t around the corner, I don’t think I would have the inclination or energy to contemplate even joining one. Now that the days are getting shorter, if I am working all day, I won’t be able to walk along the seafront. It isn’t a good idea to go alone at night. After three weeks of this work, I realised that I would never be able to do this full-time – three times a week, tops. I am grateful for the work and the money, but I miss having the time to go outside for a walk. I miss painting. Although the time can pass quickly, it is not a fun or interesting job. Doing this work has made me realise what is important to me. I just need to find a way of getting it and having it all. It reminds me of the expression ‘cash rich, but time poor’. Somehow that just doesn’t seem right. I am not really cash rich although I have more cash than I did before, however, I am certainly time poor and I am really feeling it. Now, I just want you to know that I am not complaining. Really, not one bit. I am just stating some facts about what I am doing and what I have discovered about what I want from work, apart from the money. I have learned what I am capable of and what I can tolerate. In this era of unemployment, and trust me I know about being unemployed, I am very grateful to have gotten this job, albeit a temporary one. By earning some money this month, it means that I don’t have to tap into whatever savings I have. I have met some nice people. If it weren’t for my colleagues on this project, I wouldn’t have had any people to talk to. We have been going into the same office for the last month and only one person has bothered to say hello to us. I find that really odd. I have never really worked in a large company before and it has made me realise what I like about working in a small to medium-sized company. The repetitiveness of the work has reinforced in me that I would like to have interaction with others and do something that would stimulate my intellect, and that offers some variety to my working day. I am not being challenged in ways where I can utilize my skills effectively. I know it’s a job and somebody has to do it, but I can’t do it for too long without being damaged by it and that really isn’t worth the money to me. I don’t think that is a fair exchange and doesn’t offer much satisfaction. It seems like being in survival mode, which is not a place I want to be in, and yet I am aware that many people are. I always find it amazing that I come across this type of thing when it is most pertinent. Yes, I need to work, but not at the expense of my health or certain things I want to do. I am still trying to find out what it is I would enjoy doing to earn money and to still be able to do what I want to – like paint and being out in nature, and dancing. I have a few ideas. Sometimes we have to try things in order to work out what we really want, or don’t want, in our lives. Sometimes we are given an opportunity to make a difference in someone’s life or vice versa without realising it. Apart from earning money, I believe I have benefitted in other ways from this temporary position. I don’t think I could have survived it without the humour and kindness of the people who I am working with. It will be odd not seeing them when this whole thing is over. I have discovered things about myself and others I never knew before. Who am I and What (the heck) am I Doing? It’s a question I ask myself regularly. Sometimes I say it to myself in a contemplative way and other times in a more negative way – like ‘Arlene, what the hell do you think you are doing? !’ I sometimes scold myself for trying new things and not having a ‘real’ job. Then we have labels we give ourselves depending on what we do: Firefighter, Secretary, Doctor, Nurse, etc. I don’t think beggar would go down very well on a CV. We also give ourself labels depending on our situation or family circumstances: Married, Divorced, Separated, Single, brother, sister, mother….you get the picture. I have been and done so many things and I still am a lot of other things too! As soon as I gave birth, I became a mother. Once a mother, always a mother. My job for many years was mothering, or parenting to make it more general. Although my duties as a mother have been reduced considerably now that my children are grown up, I am still called/roped in occasionally for mothering services. When my children have children, my job will double up to mothering and grand-mothering services. The jobs just never end. I haven’t had a full-time job since the end of 2008 when my company decided to call it a day and make us all redundant. At that time I was a PA/Office Manager. It sounded more impressive than when I worked part-time a few months later in a clothing store as a Sales Assistant (or Retail Therapist as I liked to call myself). Since I sold my house and moved to Eastbourne, I haven’t worked for money. I was busy sourcing contractors and project managing the work on my home. I have been researching my family tree and history and reconnecting with family I never met or hadn’t seen in over 20 years. I have been taking photographs, writing, and more recently I have taken up painting – not just the walls in my home, but pictures. At first I don’t think I was very good. In fact, I know I wasn’t. What I lacked in skill, I had bucket loads in determination and enthusiasm. If you want to see my progress, I have a page set up on this blog called Trying New Things. I think I am getting better. I am painting something every day. As well as my camera, I now take a sketch pad and something to draw with when I go out. I try to go to a couple of art classes every week, a life drawing class and a still life class. The lady who hosts the classes is very encouraging. I have been buying books on how to draw and paint from the second-hand book store and the charity shops. I can probably open an art shop of my own. I want to try to use everything and see what it does. I am like a sponge, soaking up everything that comes my way and then I try to filter some of it out and try to make something of my own. I have been given a task and need to produce 15 pieces in 2 weeks. I had to look up on the internet how to do two of the things I need to do! Although it seems daunting, I have ideas floating around in my head already about how I am going to do the work. I will be starting tomorrow as I had to go out and get some material. 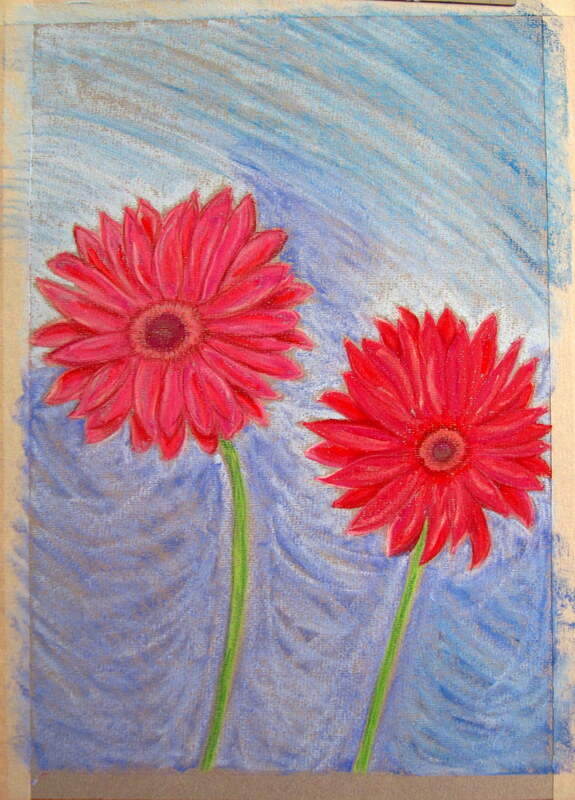 It kinda put me off my stride, so I went a bit mad and drew some Gerberas before they faded away. The reason I want to do an Art Foundation Course is because I will be able to try my hand at a variety of things I have never tried before. I will get to paint, sculpt, develop film in the photography section, work with textiles and a host of other things. After all, how will I know if I am good at something or will like it unless I try it? How will getting an Art Foundation Diploma affect or improve my work prospects? I haven’t got a clue and so I am just leaving that to The Universe. In the meantime, I am painting furniture – some for my house and some to sell. I am getting my photos organised to make into cards, to sell. I may not be working and earning money, yet, but I am busy and happy with what I am doing, so who knows where that will take me? As for what to tell people who ask me what I do for a living when I tell them that I am looking for work, it was suggested that I tell them I’m a researcher. I’m not lying if I tell them that and it means I don’t have to say anything about my personal circumstances and how I came to Eastbourne. I moved here because I love it and I always wanted to live by the seaside and it was affordable. There are a few variations of this phrase, but I really like Ms. Keller’s take on it. She makes a good point about staring at the closed door. Many of us can get stuck in our drama rather than accepting events as they unfold around us which prevents us from moving forward and missing an opportunity that could transform our lives. I have been guilty of that on occasion. Stuff happens. Good stuff and bad stuff. When the going is good we tend not to think twice about it and just enjoy the moment. However, when the going gets bad we agonise over things and create a drama about it, which in turn stays in our present moment longer than we need it to. There is something to be learned/gained from every experience we encounter. We just don’t always know what that lesson is going to be, or how we will benefit from it. Sometimes we need to have a little bit of faith that everything is going to work out, because it usually does. Most people are resistant to change. If it isn’t broken don’t fix it. What if: if it may not be broken but we can make some improvements? It is usually when change is thrust upon us when we least expect it that we go into a panic and start to resist. I believe that our subconscious thoughts send out signals to The Universe which attracts situations to us to deal with. Unhappy with your job but not really doing anything about it? Was that really a coincidence that you were made redundant? Don’t really like where you live but haven’t done anything about changing your space? Was it really a coincidence that your landlady is selling the property and you have to move? (this actually happened to a friend of mine) Not happy in your personal relationship but unwilling to change the status quo or hoping things will work itself out? Was that really a coincidence that the relationship didn’t work out? The thing about the situations listed above is that they are all things we wanted, change, but for some reason we got stuck about doing anything about it ourselves and The Universe intervened on our behalf. The Universe is great that way. Unfortunately, the kick up the backside we needed to move forward may not have come to us in a way that we would have liked. But then again, would we have done anything about changing our situation without drastic measures? Food for thought. When things come to us in ways that are unexpected sometimes we get into a panic. It is important at this stage to pause and reflect and to try to accept the situation. Then we can move forward with a clear head and maybe a plan. Most things happen for a reason. What if instead of waiting for the unexpected to happen to us, most likely in a way we won’t like, we took baby steps to make changes in our lives which would take us closer to our goals? That seems to make more sense on a positive scale and is also very practical. When we take baby steps towards our goals and keep a positive outlook, The Universe listens. The Universe is always listening and will always give us what we ask for if we really want it. We just need to know how to ask because we also may get what we don’t want, or it may seem that way because we may not really believe that we deserve something good.